Stephen Covey wrote…”your mission statement becomes your constitution, the solid expression of your vision and values. It becomes the criterion by which you measure everything else in your life.” So too in our congregations, a mission statement must be more than a plaque on the wall or an accessory to adorn your website home page. It must be the solid expression of your vision and values, to be lived out in everything you do and aspire to do. The challenge is finding ways to make the mission statement a living document and to keep it out front so that members of your congregation see it and feel it and experience it all the time. My home congregation, the Unitarian Universalist Church of Delaware County in Media, Pennsylvania, has found a unique way to do this. Our mission statement, Engage in Loving Community, Ignite Personal Growth, Serve with Integrity, forms the outline for the agenda in each Sunday’s Order of Service. 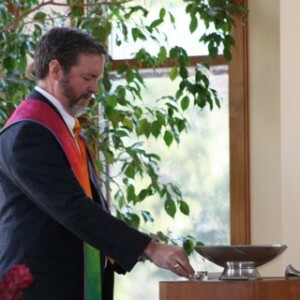 We begin by “engaging in loving community” through morning songs, recitation of our covenant, greeting our neighbors, call to worship and chalice lighting, and a brief presentation from a member of the congregation on what engages them about our congregation and our Unitarian Universalist faith. Next comes “Igniting personal growth” which includes the reading, a personal reflection related to the sermon theme by the worship associate, stones of joy and sorrow, the pastoral prayer, the singing of Spirit of Life, a period of sacred silence, and the sermon. Finally, we honor “serve with integrity” by asking the congregation to take a few moments to reflect on the questions, “How have I lived out my Unitarian Universalist values and principles this past week? and “What are my intentions for the week ahead?” We then share one open service opportunity and invite the congregation to serve in this capacity. The service ends with the offertory, a closing hymn and a benediction. Our order of service, then, enables us to live out our mission statement every time we come together to worship. Of course, living our mission requires more than following the order of service every week, but it serves as a wonderful, concrete reminder of who we are and what we stand for. For more information about our worship service and its relation to our mission statement, please contact the Rev. Peter Friedrichs, Lead Minister, at minister@uucdc.org. Mark Bernstein is a member of the Congregational Life Staff of the Central East Region of the UUA and has been a loyal and loving member of the UU Church of Delaware County for over 21 years. He has never met an order of service he didn’t like.